Mattie Kenny was sanguine over the late penalty that almost wrecked his Sunday afternoon in Parnell Park. With Dublin two points up as the clocked tick towards 77 minutes despite the concession of four goals - each of which felt every bit the "sucker punch," Kenny described them as afterwards - Austin Gleeson launched one final hopeful ball towards the Dublin square. Therein, Darragh O'Connell and Tommy Ryan lay immersed in a bout of wrestling that Fergal Horgan interpreted to be a penalty to howls of indignation from home players and supporters. 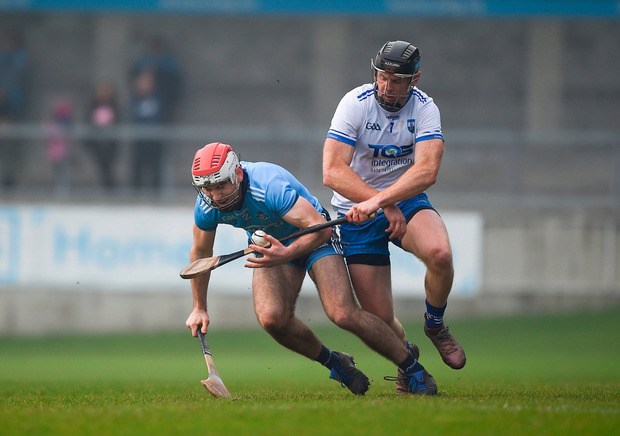 Suddenly, having done the majority of the day's hurling, Dublin faced another deeply unfulfilling Sunday in a row after last week's underperformance in Salthill. O'Connell was even sent off for what appeared to be a straight red card, presumably for over-zealous remonstration, just seconds after Horgan had booked him for the foul. That left Stephen Bennett, who had 2-7 bagged by that stage, standing over a potentially match-winning penalty. Dublin 'keeper Alan Nolan, who was earlier directly culpable for Bennett's first half goal after miscontrolling a poorly-struck free, moved early batted the penalty dead. Full-time. "Like all good managers I didn't see it," smiled Kenny although his reaction was sweetened by the result, Dublin's third win and best performance in four Division 1B games. "I was up at the other end, 100 yards away." More generally, Kenny expressed satisfaction with the performance of his lesser-appreciated attack. "There's an old saying that goes back for many, many years - goals win matches," Kenny noted. "And Waterford got their goals there today. When you concede four goals, it's always going to be difficult to win. "A lot of the performances to date have been driven by our back six or our back eight," he observed. "Today's victory was driven by our front eight." Danny Sutcliffe led the way with his best Dublin performance in years. Playing at centre-forward, Sutcliffe luxuriated in the space granted by Gleeson's reluctance to vacate the central channel of the Waterford defence, scoring 0-4, directly assisting another 1-2 and was also fouled for another 0-2 of Oisín O'Rorke's tally of 0-11 (7f). Liam Rushe (left), meanwhile, gave a timely display of ball-winning - scoring a second-half goal after a turnover he helped generate and providing astute leadership late on with a couple of clean puck-out catches and intelligent assists. "That was a really good Waterford team," Kenny noted. "They move the ball so well and are so comfortable on the ball. Our lads had to work hard to keep closing them down. Games like that can only bring you on." 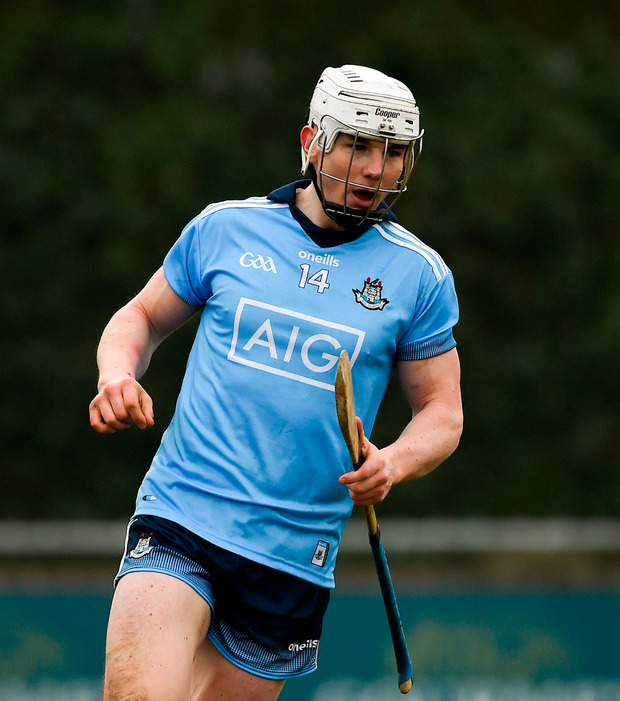 SCORERS - Dublin: O O'Rorke 0-11 (9f); L Rushe 1-1; E Dillon, D Sutcliffe 0-4 each; J Hetherton, C Crummey 0-2 each; S Barrett, F Whitely 0-1 each. Waterford: Stephen Bennett 2-7 (1-7f); Shane Bennett 1-2; T Ryan 1-1; K Moran, J Barron 0-2 each, J Prendergast 0-1. 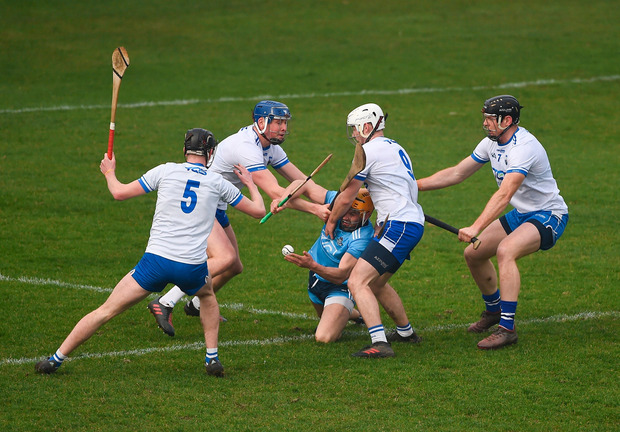 WATERFORD - B Nolan 7; S McNulty 6, C Prunty 7, N Connors 6; C Lyons 5, A Gleeson 7, K Moran 7; J Barron 7, M O'Brien 5; DJ Foran 5, S Roche 6, J Prendergast 6; T Ryan 7, Stephen Bennett 8, Shane Bennett 8. Subs: M Walsh 7 for Foran (h-t), M Kearney 6 for O'Brien (h-t), Philip Mahony 6 for Lyons (54), J Henley 6 for Prunty (58 inj), Pauric Mahony 6 for Prendergast (61).